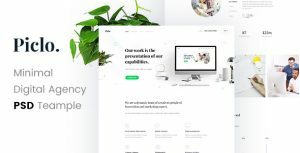 Swift – Minimal Blog PSD Template – Being the most at the least, Swift is definitely a minimalist! It is using only elements that are necessary to a given Personal and Creative Blog. A straightforwardly clean layout and a bare use of color make Swift become a design that’s aesthetically pleasing but minimal. Set of nearly-invisible dividers exemplifies the “less is more” ideology. Packed with 4 layouts for homepage, it creates an iconic and compelling blog with an extremely fresh look. Enjoy blogging!